Home → Made in U.S.A products -Veteran-Owner → Do you walk with a limp? My question, “Do you walk with a limp?” is not about walking. During the journey through life, each of us encounters trials and storms which will have an influence on our lives. These storms and their influence may be for our good or our detriment. This is why the foundation on which we build our lives is crucial. When the foundation of our life is strong and secure, we will weather the storms of life. Having a sound foundation we often come through the storm without lasting effects, although memories will remain. If our foundation is not secure, never tested, the storms of life can crush us – leaving open wounds. We cannot thrive in life attempting to live with open wounds. Open wounds limit our ability to fully embrace life. Healed wounds might leave scars. Scars remind us where we have been, not where we are going. The focus of many churches today is the 4-14 window. The 4-14 window references the statistic that t80% of Christ Followers make the decision to do so between the ages of 4 and 14. Unfortunately, with many churches focusing on children and youth, they leave adolescents and adults to figure things out on their own. This is the reason Mounted Eagles Motorcycle Ministry and other ministries exist – to minister to the members of the community other churches miss. Understanding many members in our community do not have a church to call home, we desire to be a resource, a trusted friend. As a veteran and motorcycle rider, I identify with both communities. As a member of both communities, I have observed similarities. Veterans often have a difficult time reconciling their past with the sermons they hear in church. Church members find it hard to relate to or accept the veterans. 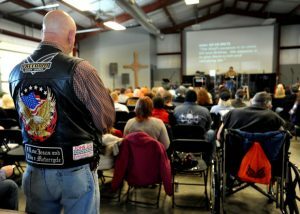 Veterans and motorcyclists often do not conform to what many church members think of when describing a typical church member. When a person is not accepted by the church body, they will choose to not attend. Not attending church, the individual misses the opportunity to develop or reinforce their foundation for life, what one believes or considers valuable. When the storms come, and our values have not been established or reinforced, poor choices and bad decision are made. This became reality for my veteran community this month. A member of our community encountered multiple storms and personal challenges. Not having a church body, withdrawing from his community, isolating himself, he ended up committing suicide. (Approximately 22% of suicides are Veterans). Not long ago a motorcyclist in our community was killed during a charity ride. When his family was planning his funeral he had no church home, no minister to call. These times happen more than we realize or admit. Presiding over a funeral is challenging, more so when the deceased is a stranger. Last year I was asked to speak at a veteran’s funeral. These events are why I choose to minister to the members and friends of my community. During these difficult times I am able to come alongside the ones grieving, as a friend, offering encouragement and a shoulder. We discuss faith, share truth from the word of God and pray. It is during these times hearts and minds are seeking comfort. Comfort from the only one able to provide complete comfort and peace, Jesus the Christ. Do not be anxious about anything, but in everything, through prayer and petition with thanksgiving give thanks, then He will give the peace that surpasses all understanding. We are available if you have questions, request prayer or want to support our ministry.